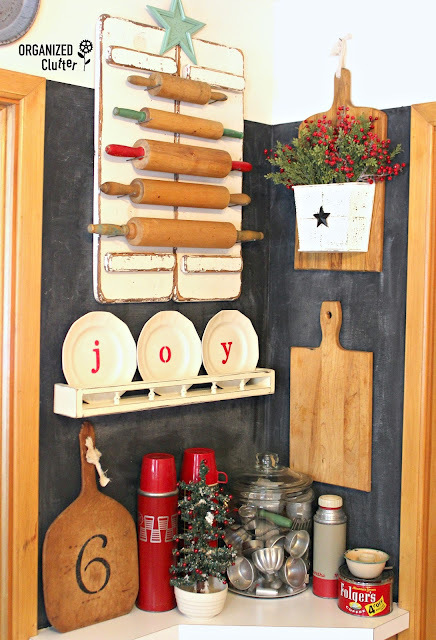 In February of 2014, I created a wall display in my kitchen with a barn board, mismatched hooks, cutting boards, a shutter, and a chippy step stool. See that post here for details. I still love it, so I work around it at Christmas time. This year I added a "Vintage Christmas" Sign, a wispy faux pine wreath with a scrap of red checked ribbon, vintage Christmas post cards and a tree shaped cutting board transformed into a Christmas card holder. 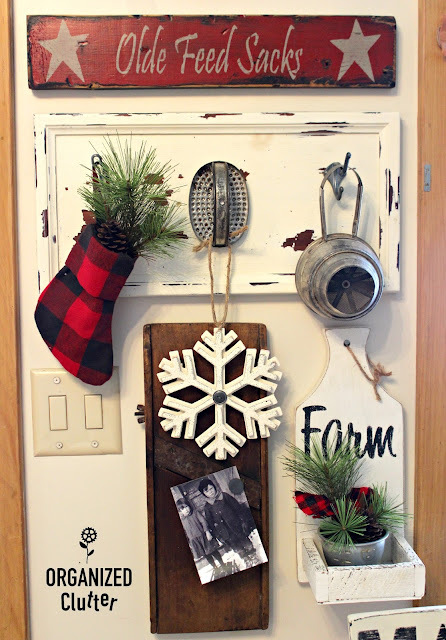 Another wall in my small kitchen, between the door to the deck and a window, is decorated with a "Feed Sack Sign", a slaw cutter with vintage family farm kids' photo, and two of my re-purposed projects, a cutting board "Farm" wall shelf, and a free drawer front with hooks. My corner shelf wall has three of my projects, along with Christmas decor. 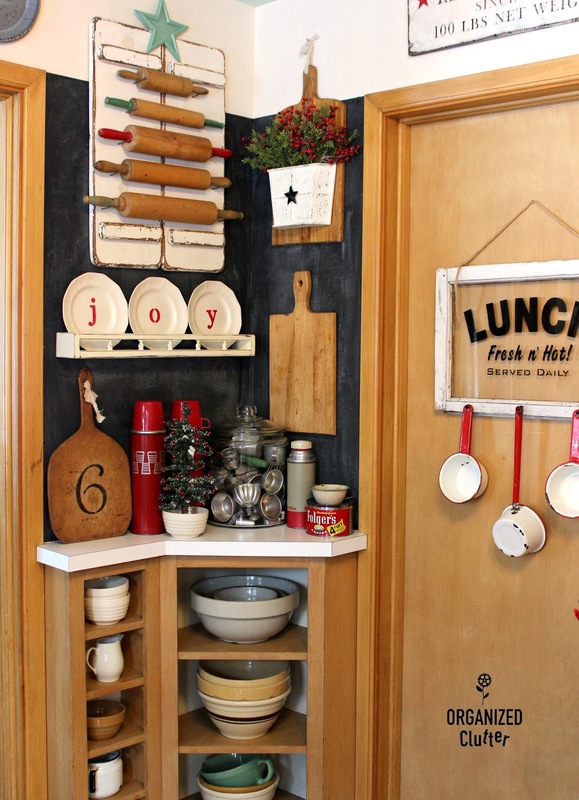 Ironstone plates stenciled with "JOY" to replace the "EAT" plates from the plate shelf project. My recent cutting board/wall pocket project, and my hanging rolling pin display. The bottom of this corner has shelves with my vintage bowl collection. This vignette is not in my little farmhouse kitchen. 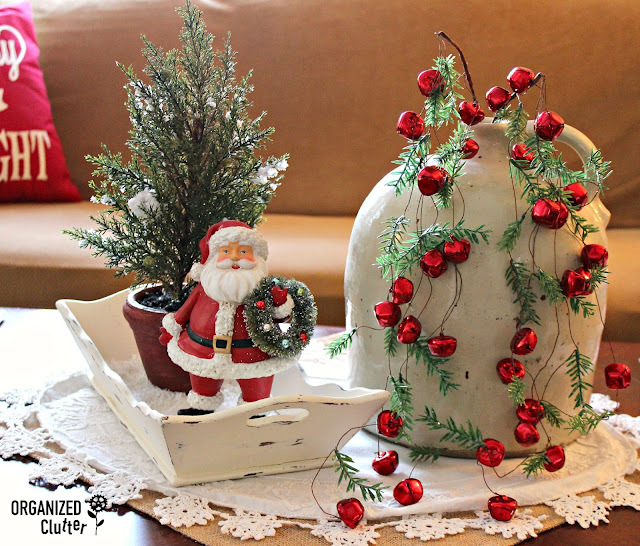 It's on my coffee table but I had to show you the fun and adorable RAZ Imports' wispy jingle bell and pine spray/picks I purchased this year and stuck in an old stoneware jug! So many wonderful ideas...my favorite is the cute JOY plates! Love all of these...rolling pins are my fave! Carlene, I love RAZ products -- where did you get the cute jingle bell/pine picks ? You are so creative! Love the rolling pins as a tree. The jingle bell garland is darling. OMG !! lOVE ! lOVE ! lOVE ! ABSOLUTLY DARLING !! WOW! 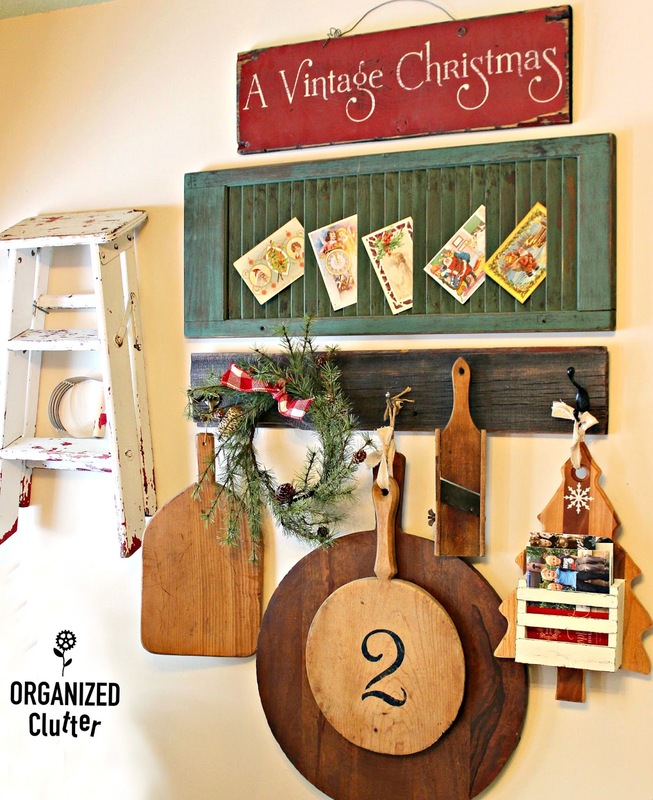 I want to replicate your corner shelf display in my antique mall booth - I love it! Well done! Where have you been all my blog reading life?! So cute, your kitchen is just adorable, I love it!! !